I will appear on ABC (Australian Broadcasting Corporation) RN (Radio National) show Future Tense Sunday 7 May 2017 10:30AM. They also have a podcast. In Japan they’re constructing a passenger train system that will travel at speeds in excess of 600 kilometres an hour. Now that’s fast, but it’s not fast enough for some. New Hyperloop technology promises the speed of sound. But can a train really go that fast? And why would it need to travel in a vacuum tube? Also, we meet a man with a revolutionary new approach to runway design. He wants airports to look and function like velodromes, with planes landing and taking off on a donut-shaped runway. 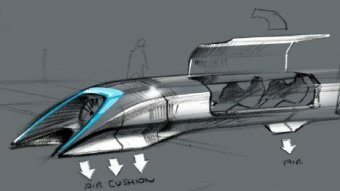 Anthony Funnell wrote this up: Hyperloop or hyper-loopy? The race to make high-speed tube travel a reality. I abstract my bits below. Both HTT and Hyperloop One are yet to do field tests using human passengers. For this reason, the University of Sydney’s David Levinson argued it was premature to be building a business case. Hyperloop tech promises travel at the speed of sound. But can a train really go that fast? “They’re going to put people into a sealed container and accelerate them at very high rates of acceleration, sometimes around curves,” he said. “We don’t know how normal people will react to that because we haven’t done that before with normal people. “This is sort of test pilot territory. People aren’t going to be really excited about being in a rollercoaster for a very long period of time. Dr Levinson, a professor of transport engineering, also has safety concerns. “Track inside a tube is really pretty vulnerable to attack,” he said. “How does such a thing respond if the tube gets punctured? What happens to the capsules that are inside of it? Does it gracefully decelerate or does some sort of implosion happen?